What could be easier, but look so gourmet? You may have thought that with her Italian Sausage Jalapeno Poppers she was a one-trick pony, but this is another great appetizer from my friend Kendra. The recipe is simple too, with just three ingredients and no chopping, mixing, heating, baking, or cooking, making it the perfect last minute appetizer when you need to throw together something in a hurry. Or, even when you have time to fuss, because basically for me, anything with cheese in it is always good. 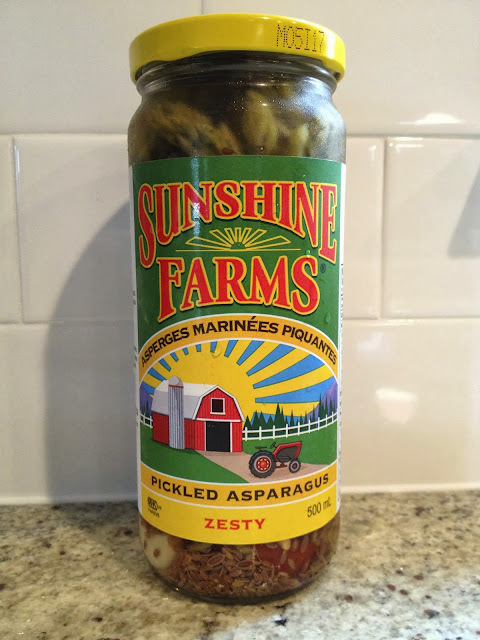 I've used the Sunshine Farms brand of store-bought pickled asparagus for this recipe, which can be found near the pickles and olives in your supermarket. I can't wait to try making this appy again once I have canned some homemade pickled asparagus this spring, hopefully without risk of botulism this time. Using paper towel, pat your asparagus dry. Lay out one piece of prosciutto on a flat surface (a cutting board works well). Spread one teaspoon of cream cheese evenly over the middle of the prosciutto. Place one piece of asparagus at one end of the prosciutto, and roll up tightly. Repeat with the remaining prosciutto, cream cheese, and asparagus spears. Serve cold on a platter, and enjoy!